Have you see this* bag? * Bag shown in photo is covered in different fabrics to the bag that has actually been lost. Approx size is 20cm x 12 cm. Several sewing accoutrement compartments inside. 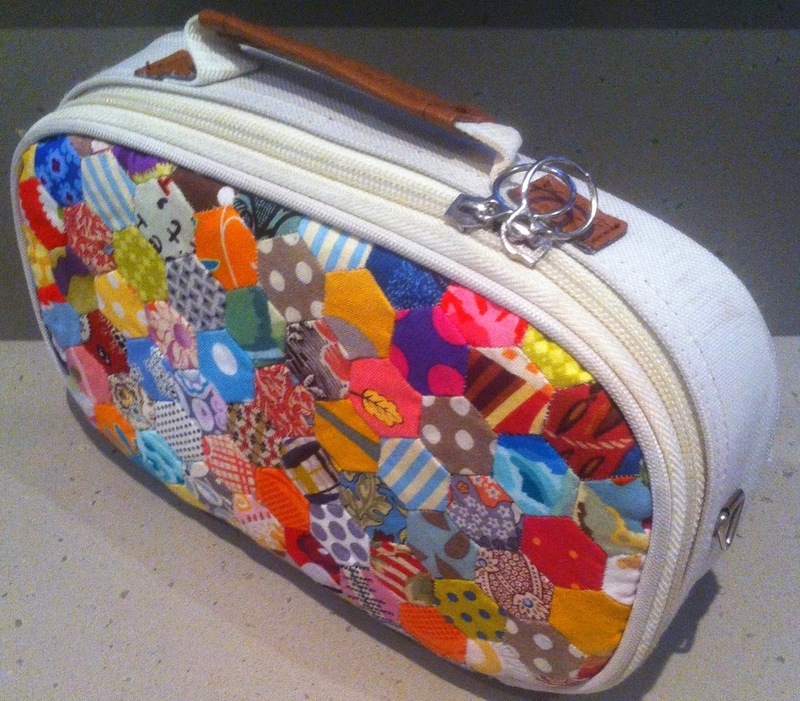 On Saturday May 17 2014 a small hexagon covered zippered bag, newly purchased from the featured shop : Material Obsession, was accidentally left at The General Meeting by a member who'd bought it for her daughter's Birthday. Designed to hold stitching essentials for quilters "on the go", these bags are extremely popular and easily individualised with handmade hexies. Would members who attended the meeting at Burwood RSL please check their sewing and handbags, as in "tidying-up" it may have gone "home" to the wrong address. If a member has collected it by mistake, then please phone the Guild Office to make arrangements for its safe return. The RSL have been unable to locate this delightful item, and it is hoped that it is hiding at the bottom of someone's basket, or was wrapped in a quilt after the "Show and Tell" segment. Thankyou to all who are checking their bags. 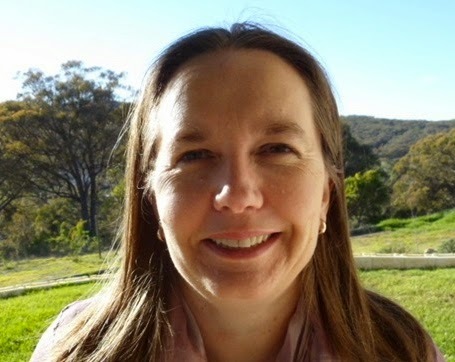 Belinda Betts, owner operator of Eucalypt Ridge Quilting services will be the Guest presenter for the June Friday Showcase. Residing near Orange, in NSW's Central West, Belinda never the less has an Australia wide client base, as she offers a "Quilting by Courier" service. She has two long arm machines and has been a quilter for 13 years. She is very passionate about bringing quilt tops 'to life' with her award winning custom and edge to edge designs, and her website offers a very useful quilt preparation list for those who are contemplating a long arm finish to their quilts. All are welcome to attend and listen to Belinda bring her quilting stories to life at the next Friday Showcase for The Quilters' Guild of NSW Inc.
Macarthur Textile Network was formed in 2010 to connect textile artists, practitioners & interested people in Macarthur and to provide learning & networking opportunities through meetings, seminars and workshops. They are currently holding their annual exhibition of members work. Come along to their exhibition and enjoy a coffee in the beautiful Japanese gardens of The Campbelltown Arts Centre. On Monday volunteer stalwarts and newcomers alike were treated to an in-depth expose of the inner workings of the Guild Office. Led by the very organised and patient Office Manager, Jane Gibson, the gathered quilters learnt or were reminded of the responsibilities and procedures involved, that if followed correctly, ensure this large organisation functions without hiccup. Jane Gibson explaining the checklist of Office Duties. the most recent Friday Showcase presenter. This training day was extremely valuable in light of the fact that the next few weeks will be particularly busy in the office. Membership renewals are due soon, there are still many queries to field regarding the July Sydney Quilt Show, The Template is to be posted, and Raffle ticket monies will be arriving. All members are reminded that the office duties administered by the enthusiastic volunteers under Jane's charge, are made all the easier to manage when members have read Flyers, The Template and forms and documents, carefully, and proof read all personal details on returning forms and cheques. The training session wasn't all "heads down". A most welcome and tasty luncheon arrived for the participants, accompanied by the mirth and friendship that eventuates when quilting volunteers are gathered! Please contact Jane should you be able to offer your time as a volunteer. She is more than happy to give individual help to anyone who missed out on attending Monday's session. crew, shown surrounded by the colourful quilts of Kathy Doughty. amusing and generous Catherine Butterworth were well worth arriving early for! (Catherine is seated in front of a Kathy Doughty Quilt). Catherine never "unpicks" but she does "adjust"! The final image shows the Guest Speaker, the extremely affable Jenny Bacon, holding a recent quilt. Her talk about the expectations of Quilt Show Judges from varying countries was enlightening and amusing. Jenny researched varying programmes from around the world prior to partaking in the 2 year Programme being offered in England. Her creative endeavours for this certificate were eclectic, rigorous and time consuming, and she shelved her own quilting pursuits, to be able to complete the course. Her hints for those quilters who might wish to follow in her steps are : Be physically fit and carry an arsenal that might include a ladder, magnifying glass and a torch. Also, have a thick skin to deflect comments and criticisms about the 'Quilt Police', and finally, have the ability to get along with many people, as Quilt Shows are organised by different personalities with varying agendas. Jenny is extremely happy to share what she has learnt, as she feels that a Juried Quilt Show is less scary for competitors when they understand what Judging entails. Jenny will be returning to Birmingham this year as a Guest Judge. It is such a large event, with approximately 800 quilts, that it requires 21 Judges to be involved. Various committee positions have changed and the "vacant" President's role has now been allocated to the current Vice President, Linda Butcher. Congratulations Linda upon offering your leadership! Updates about the forthcoming Sydney Quilt Show were relayed including the news that last years very popular Jelly Roll Race is to be conducted again, so members are asked to get some teams organised for these hilarious challenges. The August meeting is scheduled for 16th. It will be "Market Day" and there will not be a guest shop or demonstration . The Guest Speaker will be a Costume Designer. Advance notice of the 2015 "Away-Meeting" was given : March 20th-22nd, to be held in the Foster area. The final segment of The Quilters' Guild of NSW Inc meetings, allows for a members 'Show and Tell'. Whilst there are no images to share from Saturday, there was some salient advice from member Prudence who held up her current WIP: a 'hexie' creation. She told the story of how the hexagons she is currently constructing are kept in a small container next to her chair, near the window, and near the lamp with Magnifying-Glass attached. This organisation of work area had never been a problem until a large tree outside the window had been removed. To her subsequent horror, this resulted in the sun now being able to stream through the magnifying glass onto the container of papers and fabric scraps. Smouldering of the papers commenced, and this may have had a disastrous ending, but fortunately, the problem was noticed early. Prudence then held up her singed hexagons and members commiserated. Her magnifying glass now sports an oven mitt overcoat! Every meeting convenes with an afternoon tea allowing chatter and friendship to become noisier! Meg Orr and Robyn Shipton are to be thanked for quietly organising this welcome conclusion to the day. Material Obsession : that "go-to" shop for all quilting visitors to Sydney, will be the Guild's Feature Shop at this weekend's General Meeting. This Aladdin's Cave of gorgeous fabrics, quilting essentials and original patterns which inspire new direction and bubbling creativity, has the indomitable Kathy Doughty at the helm. Whilst Kathy may not be joining her enthusiastic team at the Guild Meeting due to International teaching commitments, be assured that their display will be full of "must-have" items. Some of these will be the perspex Templates that Catherine Butterworth uses for a number of her quilt designs. Catherine is one of the teachers that Material Obsession employs for their ongoing workshops and, as noted on the previous post for Template Free, Catherine will be doing the Demonstration at the Guild Meeting this Saturday at 11 am. Catherine Butterworth, maestro at visioning and provoking commercial fabric colours and patterns into motifs that dance with aplomb across her quilts, would be be less successful if her piecing skills were also not at master level. 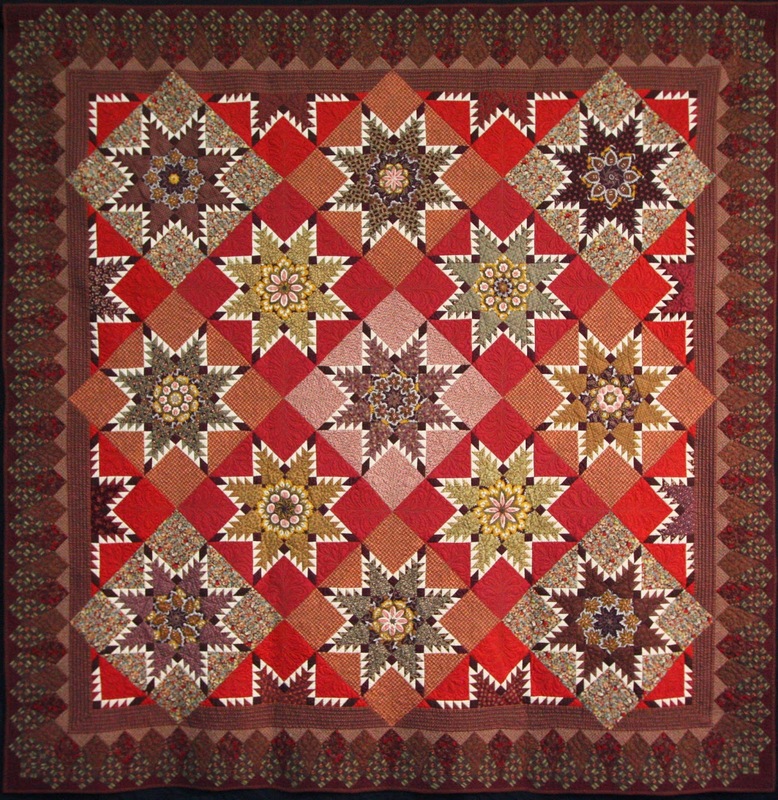 This month the Quilters' Guild of NSW Inc. is delighted to have Catherine demonstrate her machine piecing tricks at the May meeting, and invites members to see how Catherine navigates points, intersections and seams with perfection, using her domestic machine. 1st Prize in the Traditional / Professional Category in 2012. Catherine Butterworth. The May agenda promises to be extremely interesting with the Guest Speaker being Jenny Bacon, who will focus on her quilting pursuits since receiving a Scholarship from the Guild. Most members will be finalising their Quilt Show 2014 entries, however if there are any P&Q items suitable for the "Show and Tell" segment, then please bring them along to share. New Constitution for the Guild. Don't forget your completed "Block of the Quarter" Broken Dishes blocks, to leave at the Welcome Desk. Pam Furniss, Prize winning Quilt Designer and local and International Teacher, will be holding a Mini Magic Workshop for Guild Members on Thursday May 30th. 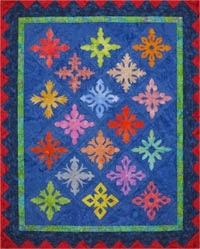 This is the final call for members wishing to learn Pam's technique of producing vibrant small quilt motifs, using very few drafting tools. Applique and quilting are all done in one simple step with the sewing machine, and even the dog-tooth border is simple to achieve! Please phone the Guild Office immediately if you would like to be part of this creative day. A workshop application form can be completed over the phone. Raid your stash of Spots and Stripes for this month's 8inch - Broken Dishes Block of the Quarter. Each block utilises two spotted fabrics in any colours and one Black and White Striped fabric. Please refer to page 25 of The Template February 2014 for accurate piecing instructions...the unfinished size of the block should be 8 1/2 inches. or : Bring blocks to the Burwood Meeting on Saturday 17 May and hand in at the Welcome Table. The graphic blocks above are currently in the Guild's Office and are unnamed, thus will be donated to the "Winner takes all" basket. Members, please name your block if hoping to "win" the collection at the draw.